I acquired some Ghost Knifefish one day to study their movement in water. They have a peculiar way of swimming vertically, and are sporadic and highly rhythmic. Their resemblance to musical notes gave me the urge to feel their rhythm, and possibly even hear their melody, if possible at all. 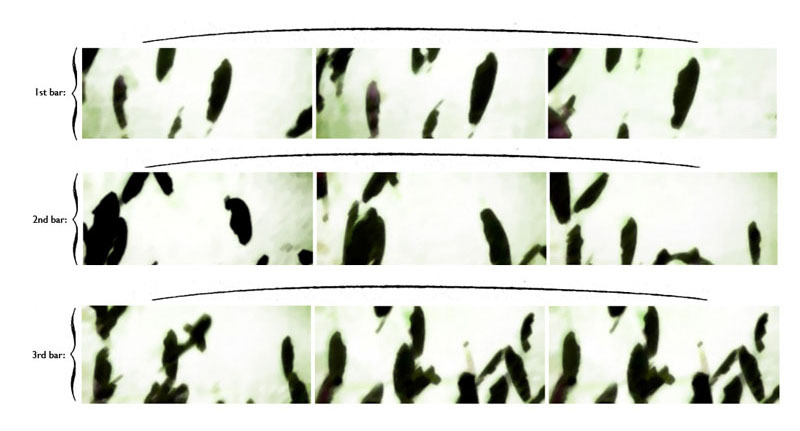 The photographs were extracted from a video of the fish swimming. Each photograph in a bar is one-second apart. Here, I was trying to merge three seconds together to indicate the direction of their movement.